I wasn’t sure I would go to the Willard tour this past weekend until I was recently contacted by Ken Paddock. When Ken told me the story of his aunt Helen who died at a very young age as a patient at Willard, I really wanted to meet him. His family had kept an amazing collection of documents and artifacts related to her death in 1928 at the age of 17. She had contracted a disease (possibly scarlet fever) at a young age which caused blindness and other problems, and she was sent by the family to The Syracuse State School for Mental Defectives. She was transferred to Willard when the State School could no longer control her. The collection contains letters written to the family about her situation, including a letter from the head of the State School advising the family why she would be moved. Ken’s mother rarely talked about her older sister, and it wasn’t until just before her death in 2001 that details about Helen’s institutionalization started to come out. It is amazing to me that these artifacts were saved by the family, especially since it seemed that no one spoke much about her for such a long time. I met Ken, his wife Kathy, and their cousin Carol at the Taughannock Falls overlook on Saturday morning and was shown a binder full of artifacts. They encouraged me to talk about her life, and are graciously allowing me to photograph the collection, which I hope to do later this summer. It is great to be able to use her full name as this collection is in private hands and does not come under the state’s control. So, here’s a kind thought for Helen W. Howden, and thanks to Ken’s family for sharing her story. We got up to Willard at around 12.45 and were organized into groups for the tour. The first stop was Brookside, which is where the medical director and his family lived. It is a lovely early 20th Century house and situated right on the shore of Seneca Lake. As usual I was drawn to one of the three kitchens and took a few shots before I headed downstairs. This device was used when the family wanted to request something from the staff. When Craig Williams and I were looking at it, the buzzer sounded when another member of the tour pushed a button in one of the upstairs rooms. Next stop was the game room in the basement. I am not sure which director’s family would have used this foosball table, but it was most likely Dr. Anthony Mustille’s children. Since I had already been in several of the buildings on the tour, Peggy Ellsworth suggested I come over to the morgue when it was between groups. She is one of the main boosters of Willard’s past, and spends a great deal of her energy keeping the spirit of the place alive. She told me an amazing story of her first day on the job after she had graduated from the nursing school. It involved her first autopsy when she was standing right where she is in this photograph. It constantly astounds me that evidence of how these rooms were used is still in place decades after Willard’s closing. The morgue building is a tiny little brick edifice that I had never been able to get into on my earlier visits. So many interesting aspects to this room. This is the faucet at the head of the autopsy table. And who knows why this retractor was left behind? It is really quite a space, and reminds me a bit of the autopsy room at Ellis Island that I photographed a few years ago. After I left the morgue I headed over to Elliot Hall which was built in 1931. It reminds me of several of the other state hospitals I have visited; long corridors with day rooms at the end of hallways. And the stairwells are very similar to ones I have photographed at other institutions. Before leaving to head home, I stopped by the cemetery where the Willard Cemetery Memorial Project folks arranged this nice remembrance of Lawrence Marek (unfortunately not his real surname) who while a patient at Willard dug over 900 graves for those who died while living at the institution. The next tour of Willard should take place again next May. It is a great opportunity to meet former staff and see first hand what an amazing place it was, and in many respects, still is. 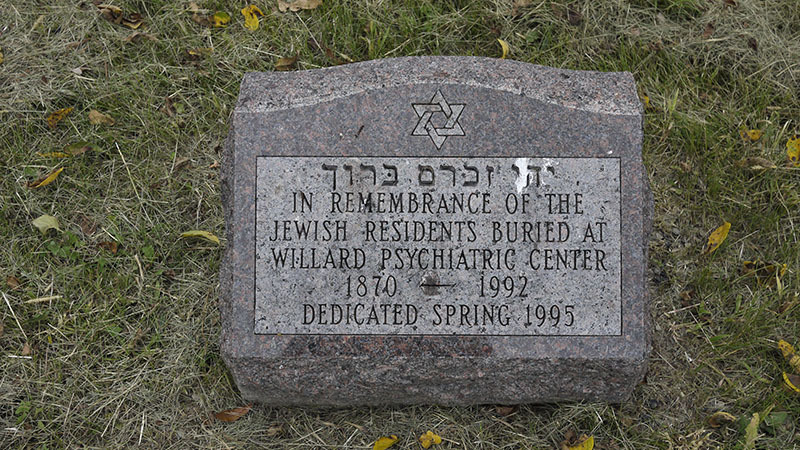 Every time I go to Willard, NY to do some work relating to the Psych Center, I go to the cemetery and walk around. The setting is really beautiful; a huge rolling field with a view of Seneca Lake. It is also a very moving place. For reasons I have never completely understood (or agreed with), the only names on headstones are in the veteran’s section. 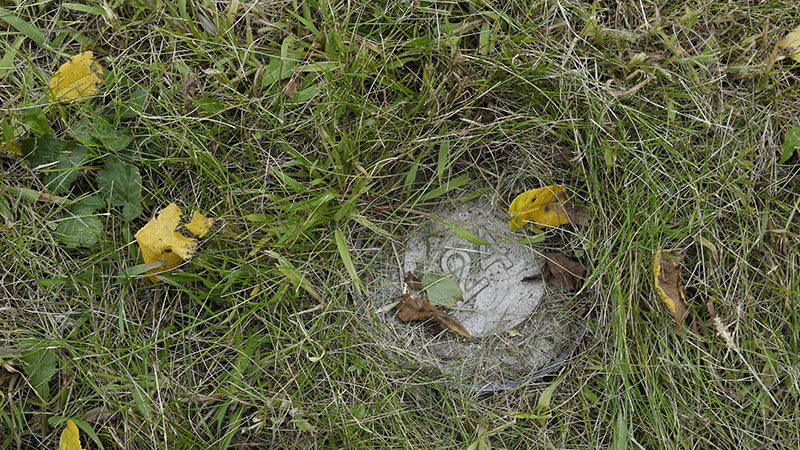 All other graves are marked with a number. I spent all day Friday photographing the wonderful people who worked at Willard before it was closed, and then Brad Edmondson and I walked across the road to have a look. I was struck by the fact that it was late Friday afternoon on the 10th of September, the last day of Rosh Hashanah.